Nothing really feels better than receiving a compliment on an aDOORable accessory that you’re rocking, and getting to say “Thanks, I MADE IT!” Bossmode goes into full stellar swing, and suddenly all your gal pals are either begging you to design one for them or want you to host a girls’ night to show them how. 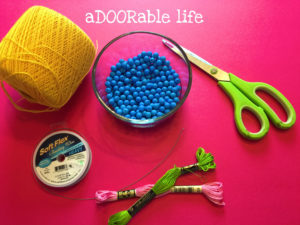 Either way, check out this tutorial solo to be the envy of the office, or gather up your gals for a fun night of crafting! Step 1: Gather up your materials. 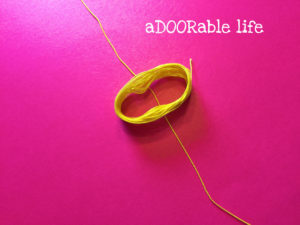 Step 2: Start unrolling the thread and begin wrapping it around your hand, keeping count as you go. Step 3: As you’re wrapping, keep count and try to keep the strings straight to avoid knotting later. You want to wrap the same number of times for each tassel. I used magic number 16 on my tassels! Less will make them smaller, more will make them bigger! 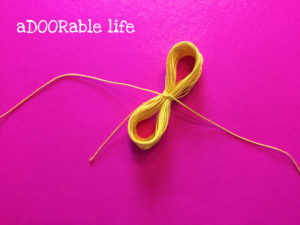 Step 4: Using a sharp pair of scissors, cut the string. 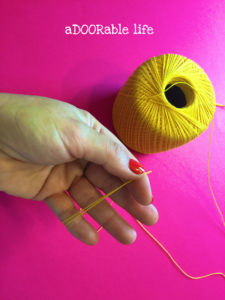 Lay this loop down gently, being careful not to mess up the threads. Cut another thread about 5″ or so. 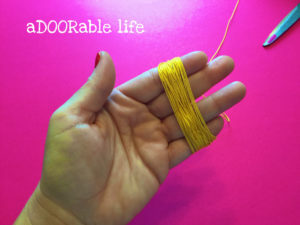 Lay your thread loop over top of your 5″ thread. Step 5: Very carefully tie a knot in this thread. In fact, knot it twice! Then make sure the knot is in the CENTER. Step 6: Gather up both ends of the loop into one, so that all the strings are gathered together. 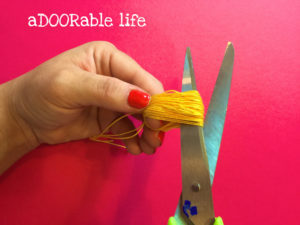 Step 7: Insert your scissors into the loop. Using the scissors, pull the threads tight and make a clean cut. Step 7: Cut another piece of thread about 5″ or so. 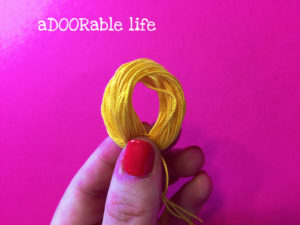 Lay your thread bundle on the 5″ piece leaving just a little bit of space between the 5″ piece and the top end of the bundle. Step 8: Double knot this 5″ piece as closely and as tightly as you can. This is the step that brings all the tassel strands together. 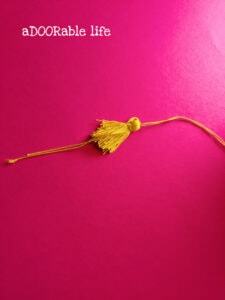 Trim any stray strings to even up your tassel. Step 9: I used a heavy gauge jewelry wire that was recommended to me by the sweet girl at Michael’s. Thread the wire through your tassel next to the top and then add your desired beads in the style and pattern that floats your boat. 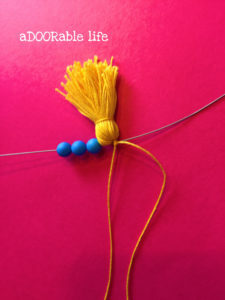 Create more tassels to add if your heart desires. This is YOUR creation, let it sing your song! And TAAAA DAAAAAA!!! Are these not totally aDOORable?! And it was that simple!! Let the tassel obsession begin!! 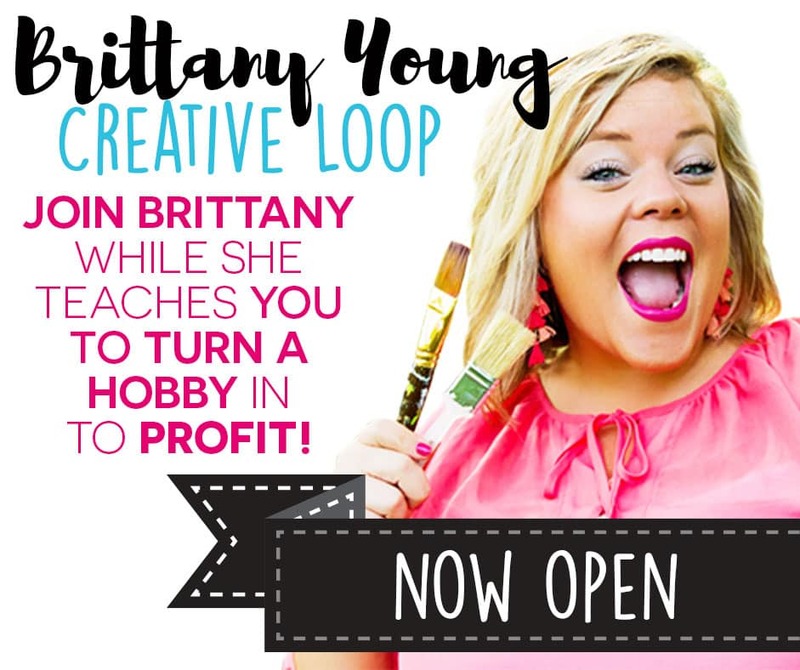 This project allows so much room to really be creative and do yo’ thang girls!! Pick your own tassel colors and sizes, pair them up with unique bead combinations, and ROCK your obsession!! Need more step-by-step direction? Check out my Facebook Live Tutorial Video! Love these but in a time crunch? 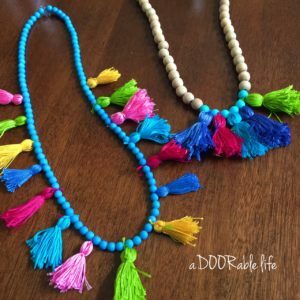 Check out these tassel beauties – ready to order!